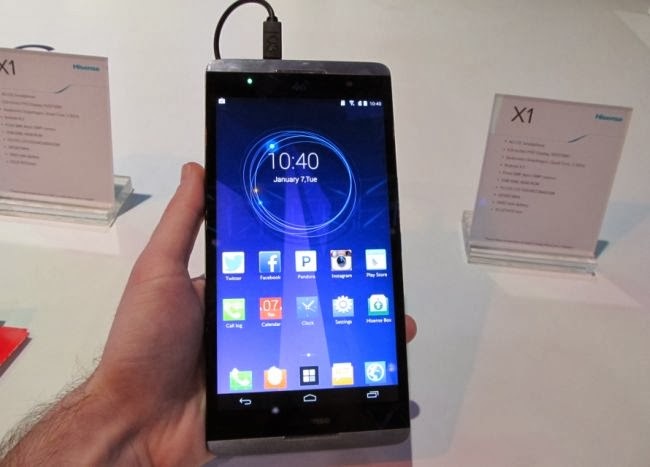 The Hisense X1 has just been launched at CES 2014, this is a 7 inch device that is really pushing the limits of smartphones that are approaching into the tablet territory. The truth is that the guys at Hisense have made a lot of research and found out that there is a significant part of the new customers that can still place this device into their pocket. Women can throw it into their purses but they are still getting quite close to a tablet experience. The design of the device is quite similar to that of the HTC or the HTC one and I have to admit that the device is really enormous in size. The device has a custom interface but the screen looks nice, it is really colorful. The display is quite nice, it is actually a full HD display that supports 1080p, it is an IPS display so as we are moving around we are going to get pretty great viewing angles on the device, inside the phone there is a snapdragon 800 Cpu so performance is very brisk. On the left side of the device there are two slots, those are for the SIM’s so the phone is in fact a dual SIM device, on the top of the device you have the micro USB port and the headphone jack. On the right side of the device you can find the volume rocker above the power button, this is a bit of a difference in arrangement from what we have seen in the past. The buttons are a bit flimsy so I am not really sure how well they will hold up. 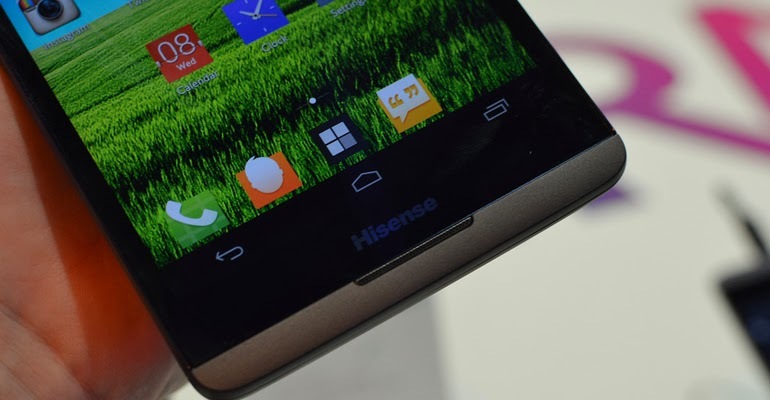 The smartphone comes in with Android 4.3 but Hisense has confirmed that when it does indeed ship, it will have Android 4.4 KitKat onboard. 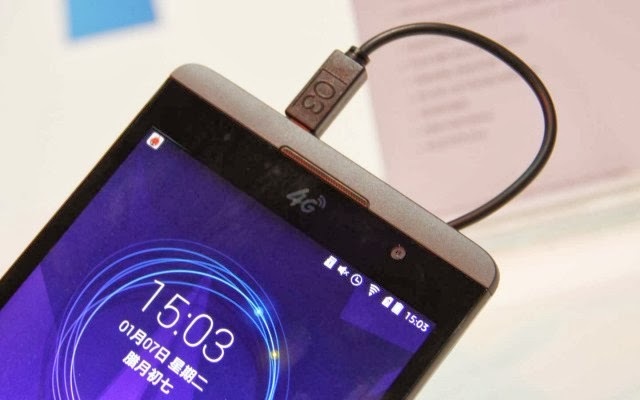 Inside there is a 3200 mAh battery, it remains to be seen how much it lasts but it is important to know that this smartphone comes in with HSDPA plus, it is not LTE, there are other devices in the lineup that support LTE bandwidth. The phone comes in with a Snapdragon clocked at 2.3 GHz. On the back there is a branding for China mobile because this will indeed launch in China in March, however Hisense has confirmed that it will come to the U.S., sometime in late quarter two and it will launch under a brand called Sliver so the phone will be known as the Sliver X1 and Hisense is currently exploring carrier partnerships for the phone so we may see it come with subsidized contract pricing. Around the back of the device you can find a 13 megapixel camera with LED flash. On the front of the device you can find a five megapixel camera. All in all the Hisense X1 is a pretty decent smartphone but I dislike the fact that it is so similar in design to HTC, I don’t think that this will help it in sales abroad. The design is quite nice, the hardware specs are decent and if you consider the fact that it might be offered for a low subscription price, this phone has a good shot to become successful on the western markets. Chris has spent many years in mobile and technology world as a mobile and wireless technology consultant and also as an author. He has been writing about various technology products, IT topics and the mobile industry over a decade. In addition to full length works, Chris is a prolific writer whose articles and how-to guides have been regularly featured by various tech-websites, blogs. TCA Wireless is one of the place where he is currently contributing. You can also follow him on Google Plus.